Give Your Heart to Haiti this Valentine's Day Giveaway | More Crunchy Beach Mama! I love when big companies do great things. Macy’s Heart of Haiti collection was started to help Haitian families rebuild their lives after the 2010 earthquake. The collection features more than 40 handmade home decor items including quilts, metalwork, ceramics, and paintings crafted by a Haitian master artisan. Accessories include vases, candleholders, serving trays, picture frames, mirrors, coasters, necklaces, clutch purses and more. The collection is made almost entirely from recycled and sustainable items such as old cement bags, cardboard, oil drums & local gommier wood. Most items fall in the range from $25-$60. The best part? Has led to employment of 750 artists in Haiti providing financial benefits for an estimated 4,000 to 5,000 people in the country. Amazing! I was honored to receive a couple of these items. 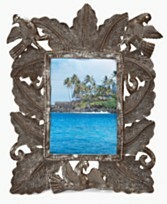 The eco-friendly and enchanting Forest picture frame surrounds images of your favorite people and places with lush and exotic Haitian foliage, all hand cut and hammered in recycled steel. Once the shaping and detail is complete, each is varnished and dried in the hot Caribbean sun. Won’t my beach pictures look great in here? Made with metal recycled from oil drums, these one-of-a-kind pendants embody the unparalleled creativity of Haiti’s master artisans. Handcrafted with cool textured detail for a look of rustic beauty. 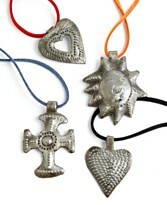 The hearts pendant is perfect for me to wear for this month of love. Wouldn’t the sun look great on me too? I received these items for review from the EveryWhere Team but was not compensated. All opinions are my own. This giveaway will end on Feb. 28, 2012 at midnight EST. Winners will be drawn via rafflecopter. Once a winner is drawn I will contact them and they will have 48 hours to reply before I draw a new winner. Giveaway is open to anyone in the US and you must be 18 years of age or older. Not affiliated with Facebook. Winner will be posted in the rafflecopter widget. Grade A stuff. I’m unbaestionuqly in your debt.